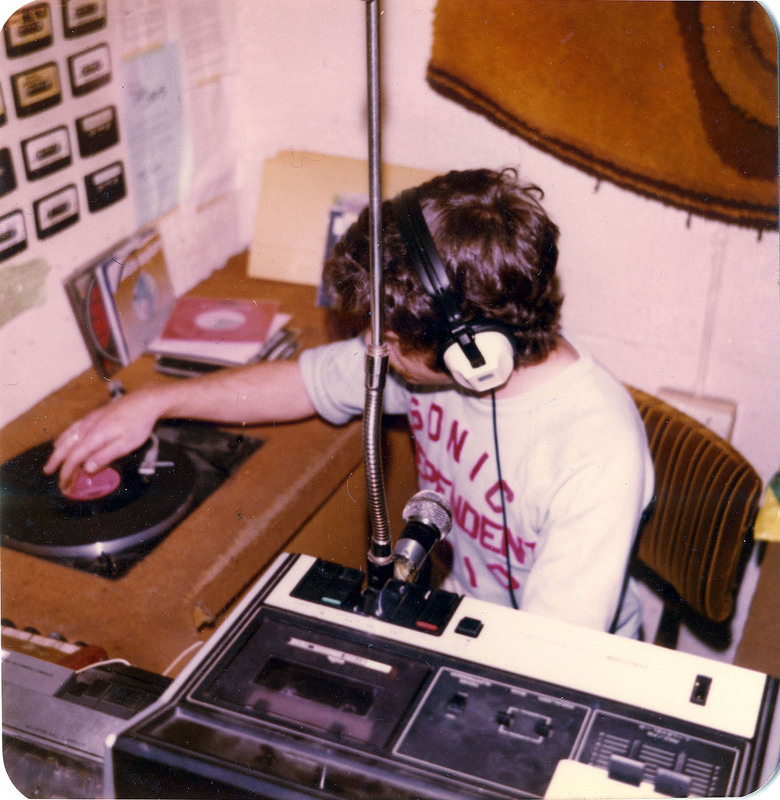 SONIC INDEPENDENT RADIO was one of the many stations that appeared in the period when AM radio was in it's heyday in the early 1980's. 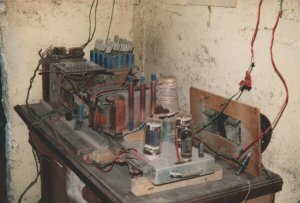 The transmitter was powerful enough to give dxers across much of the UK and Europe a chance to hear Irish homebrew pirate radio. They were first heard during the winter months of 1980 / 81, at the time when NRK Norway still closed down at night. The first log in Scotland was dated 10th January 1981, and was reported by one dxer that same night as being from Belfast, obviously because of the name "Shankhill". 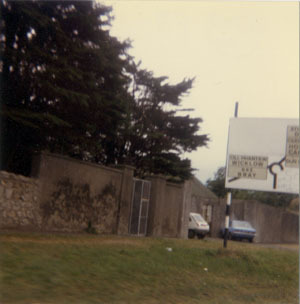 In fact this was Shankhill, in Co Dublin's Southside. 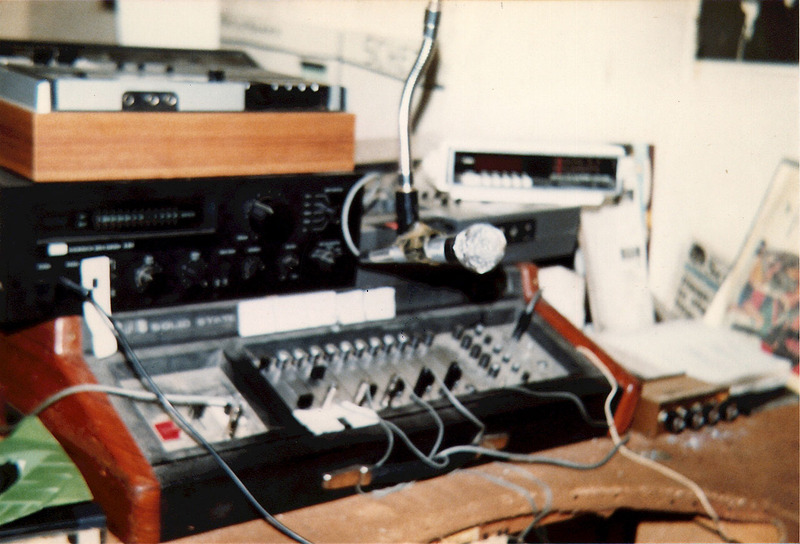 Sonic was run by the late Joe Jackson, who's transmitter was the source of many a transmission during the 80's heyday of AM pirate radio. Other names that were heard on the air were Bob Nailor, Steve Johnston, Chris Anderson, Rick J Davenport, Jenny Lowe, Mark Bradey, John Martin, Mark Jackson, Vincent O'Connel, Trevor Haig, Dave King, Barry Fenton, Dave Redmond / Reddy (some names possibly wrong, due to mw signal fading, see recordings). Left: The small but very functional studio. As you can see, out camera equipment at that time never stretched to wide angled lens. Only two out the four visitors has a flash on their camera, and I believe at one point the two tried to take photos together due to one of the flashes not working!! 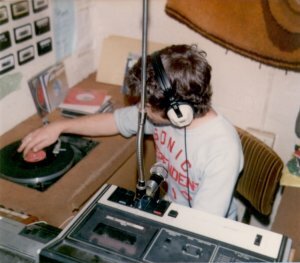 Right: Bob Nailor, who introduced himself as a radio ham, in the Sonic studio. 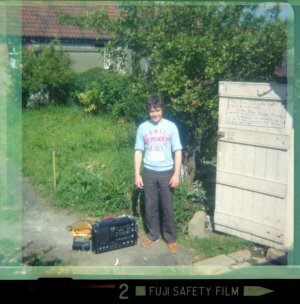 Left: Bob Nailor outside the Sonic hut, with Ken's Satellit 3400. His Sonic shirt unfortunately is barely visible even at the best resolution, but the bottom in paler writing does say 228. 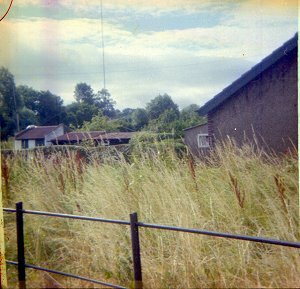 Right: The same image taken from the original negative. There is probably no real improvement on the scan from the print above, and still the writing on the Sonic door can't quite be read. What a pity. The classic home brew style Sonic transmitter, built by Peter Gibney we were told. 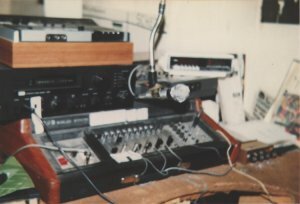 We can see a pair of 813's driven by possibly a PL519/ EL519 shape valve, and a 5763 / EL 84 shape valve as the oscillator. This transmitter broadcast year in year out, for various stations. 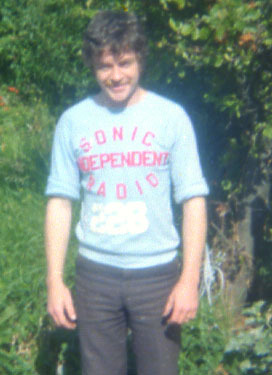 It was heard really well in 1981 as Sonic on 1314, but was later used for East Coast Radio, also on 1314. In 1982 it was used by ABC Dunlaoire briefly on 1314, before becoming South City Radio on 1314 (logged 9th June 82), 1323 and later 999. 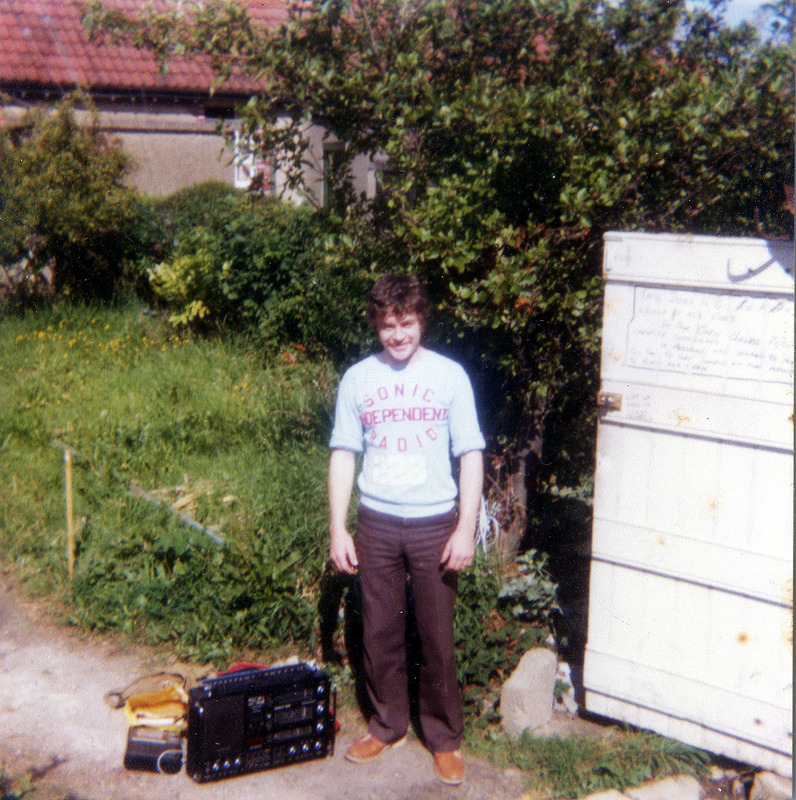 Later still we were always told that the community stations on 1134 and 1116 such as Radio Donnybrook, Radio Sandymount, CBC, Galaxy etc used the so called "Jackson txer" at one time or another. The stronger 1134 transmitter was reputed to be from Shankhill. Inner City Radio was also reputed to be using the same txer on 981kHz during mid 1984, as well as KISS AM / FM, again on 1134 and 1116 during later in 1984, logged in November. 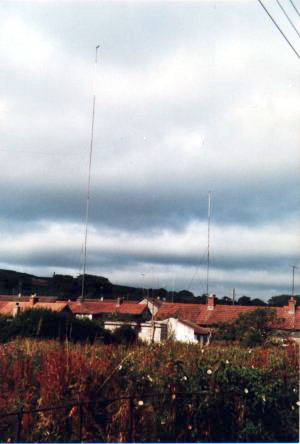 The 1134 signal was always the stronger here in Scotland, and reputed to be the "Jackson transmitter". Was this the same tx at the same Sonic shed?? Was it modified in any way?? Did anyone get to see the Inner City Radio or Kiss AM/ FM transmitter??? Who knows after all these years. Some unanswered questions remain. Something that is difficult to think back on after all these years is the signal by day in the UK. It is easy to remember the signal of Sunshine and Radio Dublin etc by day, but Sonic? Was it mainly heard after NRK went off at night? Was it heard easily by day in the summer of 1981? Was the so called International programme aimed at foreign dxers only aired on a Saturday night, or was it aired daily?? It was about that time, the second half of 1981 maybe, that NRK expanded MW broadcasting and stayed on all night, thus blocking the otherwise clear frequency of 1314. They also shortly afterwards installed a far more powerful transmitter of 1200kw, from a nominal 100kw, which really made the use of 1314 pretty much useless. Island Radio and East Coast were on the air in the winter months of 81-82 and hence virtually unheard as NRK would have been rather strong, at least in Scotland. A couple of views of the Sonic antenna masts from a distance. 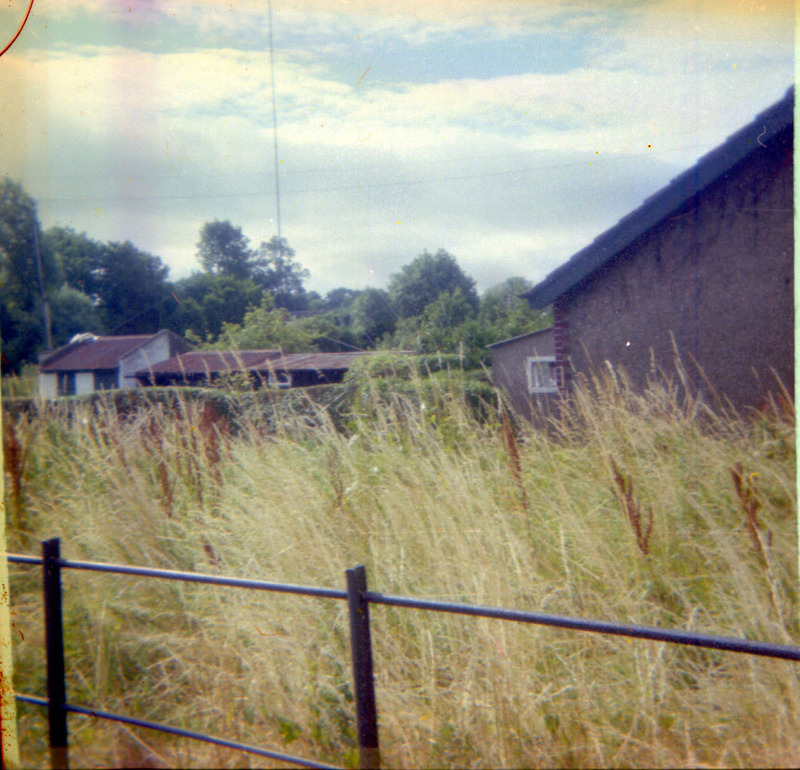 These images were sadly taken on a c126 cartridge instamatic, whose quality was questionable at best. 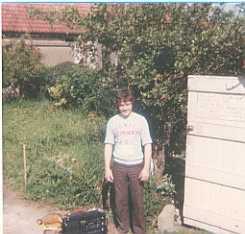 Even a modest phone can take fairly sharp images nowadays, but this was 1981!! Left: Coming into Shankhill, where the Sonic Masts can just be seen in the centre of the photo, to the right of the hill in the background. 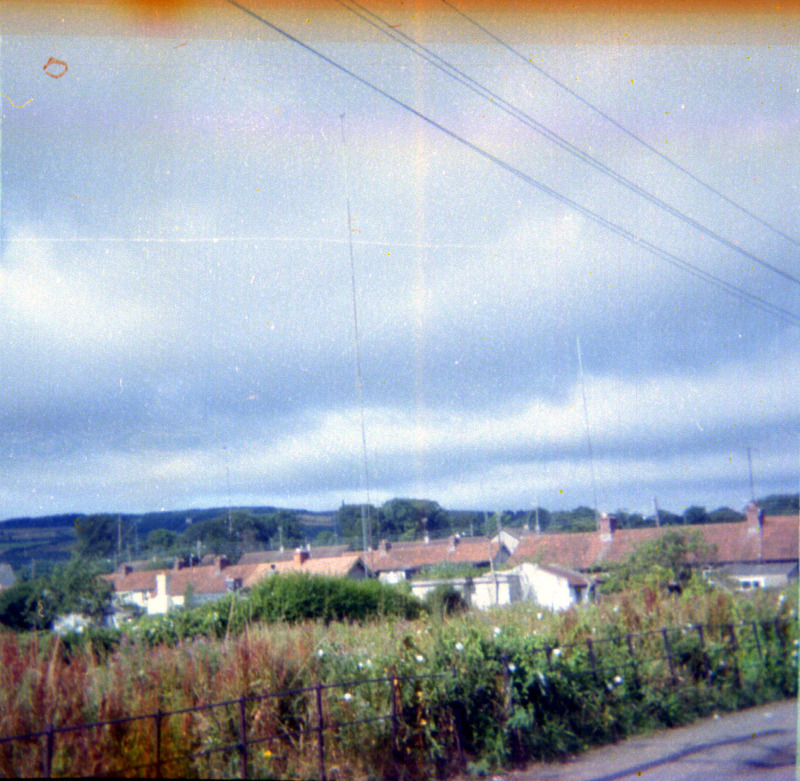 The studio was just along the road and down to the right. Right: Taken looking back at the Sonic shed from the road around the left of the Sonic QTH (looking from the front of the house). This view can still be seen today via google. And after some helpful posts from B and Mini on the Radiowaves forum, here are a couple of embedded views from Google. 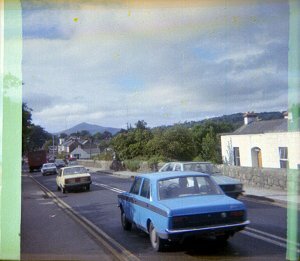 One unanswered question for me is why o' why were no photos taken from a distance of the front of the house, with the tall masts at the back?? 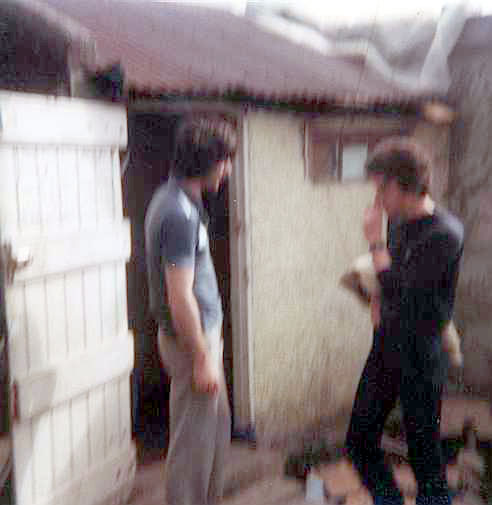 There were three young fellas with cameras there on that visit in 1981. Well it is impossible to turn back the clock now!! 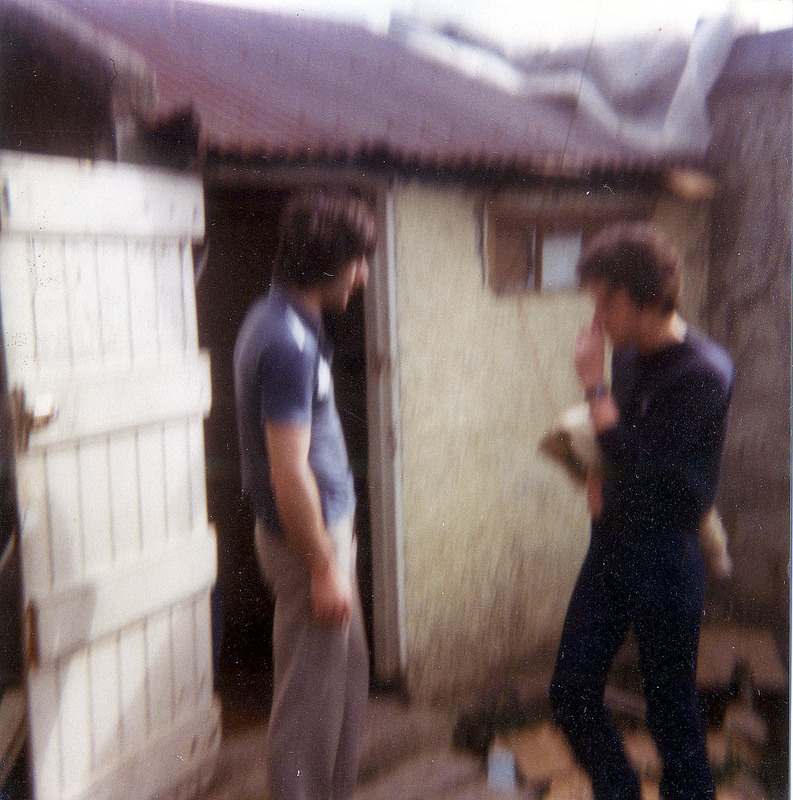 Left: A bad quality photo of Ian and Joe Jackson (left) having discussions about old times. 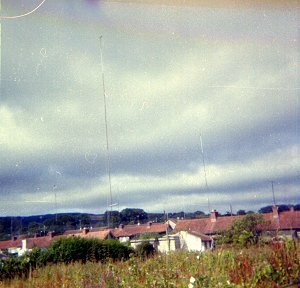 Right, the two tall masts, seen towering above the houses in Shankhill. It looks as though the right hand mast is maybe a CB antenna on the chimney?? This could be taken with our back to the so called 297m mast. You can also see something of a Dublin from a different era. In these distant times, most houses seemed to have very tall tv antenna masts up, to receive BBC and IBA transmissions on top of their own local RTE broadcasts. This is a thing of the past now with Sky Digital, and although the Irish can receive the UK terrestrial stations free to air, RTE do not reciprocate. (How very unsporting of them). One wonders where the metalwork from all those large antenna masts has gone?? On the way to Sonic, there seemed to be a multitude of road signs that had SONIC 228 scribbled on them. Unfortunately these were at junctions, and thus a little busy to stop and get a proper photo. This poor quality photo was taken out the car window!! It is just out of reach, to read the scribbles sadly.